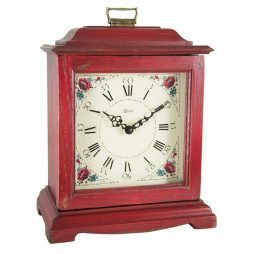 Bracket clock in a distressed red finish with a Quartz dual chime movement. Decorative dial features Roman numerals. Dimensions: 13″ x 9″ x 16″. Made in the USA. 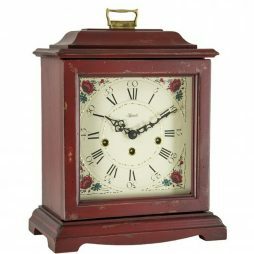 Bracket clock in a distressed red finish with a mechanical 8 day Westminster chiming movement. Decorative dial features Roman numerals. Dimensions: 13 x 9 x 16 inches. Made in the USA. 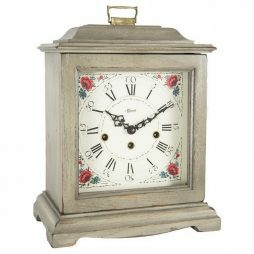 Bracket clock in a distressed gray finish with a Quartz dual chime movement. Decorative dial features roman numerals. Dimensions: 13″ x 9″ x 16″. Made in the USA. 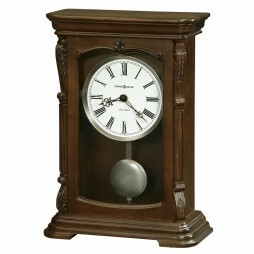 Bracket clock in a distressed gray finish with a mechanical 8 day Westminster chiming movement. Decorative dial features Roman numerals. Dimensions: 13 x 9 x 16 inches. Made in the USA. Amazing clocks which come with a variety of sought after qualities can be a rare find. Especially when it comes to one which manages to effortlessly combine its compact size with great design and style at the same time. 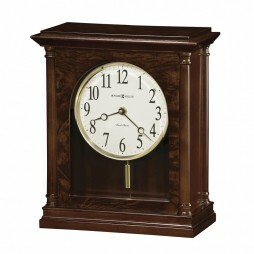 Like the Hermle Clearbrook Barrister Quartz Mantel Clock. In addition to its gleaming mahogany finish, fluted columns and exquisite inlaid marquetry, its cream colored face which contrasts with its dark numbering makes it instantly distinguishable. And that is not all there is to this delightful mantle clock either with additional features which include a quartz dual chime movement which plays either Westminster or Bim Bam chimes, volume control and a personalized night shut-off. Exquisite, refined, tasteful. No other three words sum up the Victorian age quite as accurately. And with this ornate clock reminiscent of an era renowned for its excellent style and taste, you too can suffuse your home with these same qualities. 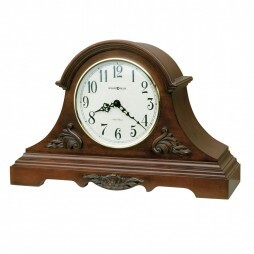 Brought to you in a cherry finish with fluted molding, the Hermle Hollins Barrister Mechanical Mantel Clock features Roman numerals and stylized hands set against an ivory background. 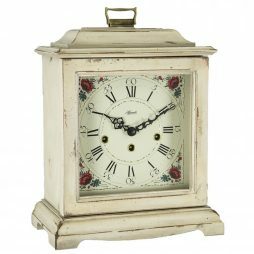 In addition to its starburst carvings and brass handled drawer which further enhance its elegance, this mantle clock also features a chime silence option. A combination of classic style and contemporary details, the Carly Golden Oak Mantel clock has wood columns on the four corners of the case and an added touch of elegance with the burl on the front and top panels. The stylish design continues with front beveled glass, and off white dial which features a polished brass bezel, Arabic numerals and black hands. A unique polished brass, cylindrical pendulum complements the bezel. 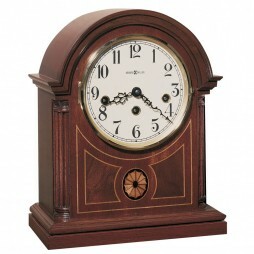 Constructed from select hardwoods and veneers, the clock offers quartz, dual-chime Kieninger movement. It plays full Westminster or Ave Maria chimes with strike on the hour, with optional 4/4 chime feature which plays 1/4, 1/2, and 3/4 chimes accordingly. A volume control and automatic nighttime chime shut-off option complete the features. 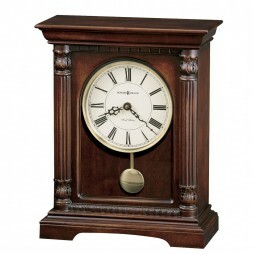 The Durant Chiming Mantel Clock will add a touch of elegance to your home! 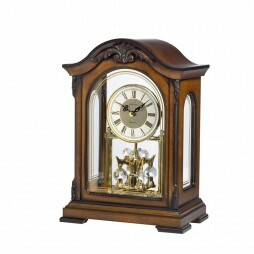 Finished in an Old World walnut finish, the solid wood case has decorative carved accents with a revolving pendulum visible from all four sides. (Decorative screened glass front and side panels/removable clear acrylic back panel). The clock features the Westminster melody on the hour and a metal dial. Customize for yourself or as a gift with the engraving plate that is included. A beautiful adaptation from the window of the Ward W. Willits House, this beautiful Prairie-style masterpiece could grace any mantel. Supported by a solid wood base in a rich walnut finish, the clock has a geometric wood pendulum and protective glass lens. Do you want to change the mood of your room from boring and dull to hip and contemporary without investing too much on redecoration? Just add this Howard Miller Murray Mantel Clock to your dcor and see how it refreshes your interiors bringing in that trendy feel you want for your home. This special 82nd Anniversary Edition mantel clock in Worn Black offers decorative details include applied rosettes and bunn feet. The aged dial offers black Arabic numerals with black spade hands beneath a convex glass crystal. Finished in Worn Black on select materials, hardwoods and veneers. 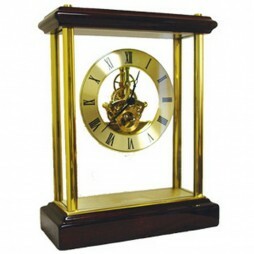 Imbue your home with the stylishness of the mid-twentieth century with this modern ornamental clock. Inspired by the minimalist design of the cube, its defining feature is the Hermle Westminster 352 movement supported by heavy pillars mounted on the black piano finish wooden base. The Hermle Chigwell Modern Design Mantel Clock is the perfect ornament for your desk or mantel piece and will immediately enhance the dcor of any room it is placed in. A combination of classical and modern design, this clock features a mechanical 8-day spring wound, Westminster movement which chimes on four bells. It has also been fitted with an 11 jewel deadbeat escapement with a separate second feature and comes with a polished nickel-plated finish. 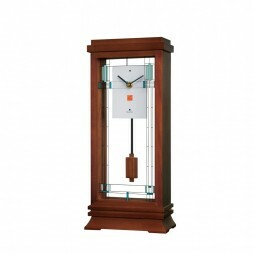 This Howard Miller Barrister Mechanical Mantel Clock introduces a modern feel to your overall dcor. 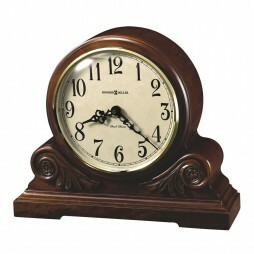 The clock features inlays of mahogany and an intricate oval of variegated maples. Warm white face with black numerals and hands, and a brass finished bezel. 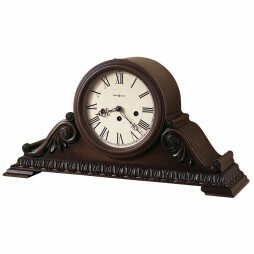 Featuring fluted columns with wooden column caps grace each side; this clock will surely appeal to the design buff in you and add to the feeling glam. 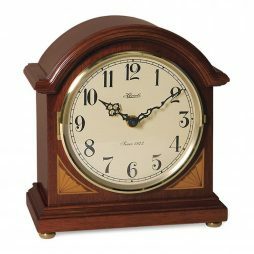 Clockshops presents this beautiful Howard Miller Lanning Bracket-Style Mantel Clock that will not only add color but will also enhance the look of your interior by many folds. It features reeded columns with carved top and bottom caps, and a decorative molding at the top and bottom of the multi-tiered base. The lamb’s wool dial features Roman numerals and a polished brass bezel. 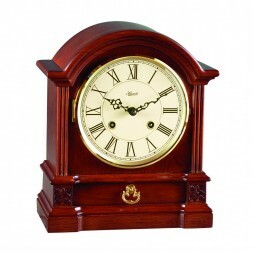 This stately bracket-style mantel clock is endowed with good quality machinery which ensures precise time keeping and durability. Inspired from innovation, this exquisite Howard Miller Arendal Special Edition Mantel Clock makes an ideal addition in your living room. 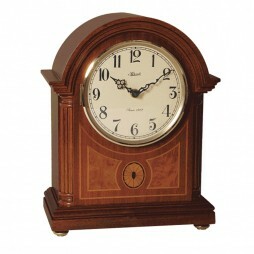 This special 81st Anniversary Edition clock features elegant curves from top to bottom. It offers carved accents and a turned finial on the crown. An antique brass pendulum is viewed behind the glass front panel. Behind a convex glass crystal, the aged dial has a special Anniversary inscription through 2007 and offers black Roman numerals and filigree designs with black serpentine hands. 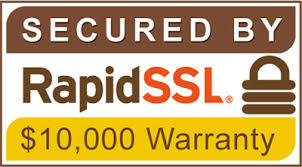 The 1 year warranty is the icing on the cake. 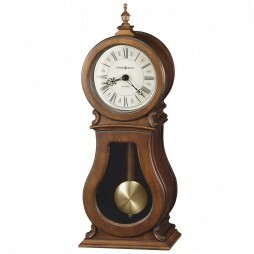 Ideal pick for your home or office, this Howard Miller Candice Pendulum Mantel Clock. 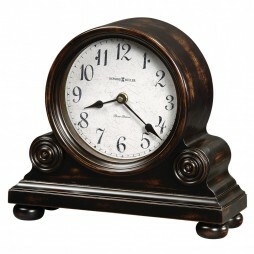 It is the 79th Anniversary Edition mantel clock combining classic style with contemporary details. Wood columns frame all four corners of the case; elegant burl adds a touch of luxury to the front and top panels. The front beveled glass offers a view of the off-white dial, which features a polished brass bezel, Arabic numerals, and stylish black hands. A unique polished brass, cylindrical pendulum complements the bezel. 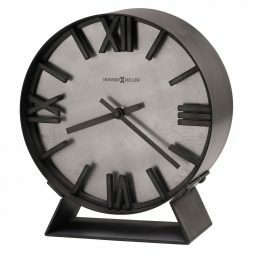 With edgy framework and stylish finish, this wall clock is well-designed to suit your interiors. This wrought iron mantel clock finished in aged iron with antique gold accents makes an amazing blend of quality and style. The dial is cast polystone with cast hour markers and raised outer edge; the hands and pendulum are finished in aged iron to match case. Quartz, Non-Chiming battery operated movement. Clockshops ensures highest standards of quality while crafting its timepieces. Shop with confidence! 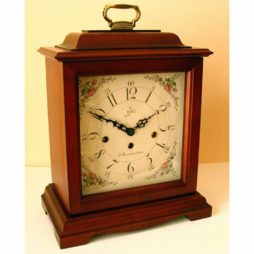 Feel the difference with this classy and stylish Howard Miller Adelaide Mantel Clock. 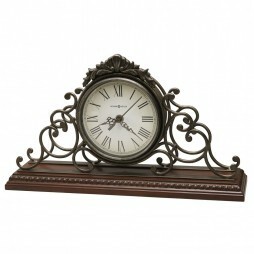 This ornate chiming mantel clock features a sculpted wrought iron frame with decorative cast crown, antique warm grey finish, and sits on a Windsor Cherry finished base. Decorative molding runs completely around the wood base. Beneath a convex glass crystal, the antique finished serpentine hands are complemented by the aged dial and black Roman numerals. The colour and design makes it special in appearance and goes well with your home decor. With a meticulous design and robust built, this Howard Miller Redford Mantel Clock can accentuate your wall with least efforts. It has an ideal dimension and sports a fancy colour combination that can co-ordinate with your interior. This mantel clock offers a unique round profile. A polished brass bezel, and turned, polished brass bun feet enhance the clock’s appeal. An aged dial under convex glass features black Roman numerals and black hands. 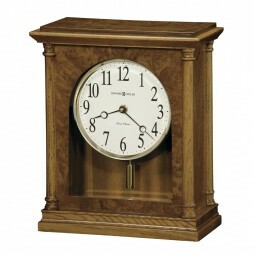 Finished in Windsor Cherry on select hardwoods and veneers, this lovely clock can also be a great gifting option. Place it on any wall of your home and add grace to your interiors. 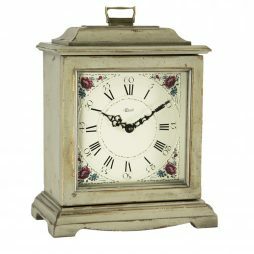 Bracket clock in a distressed white finish with a mechanical 8-day Westminster chiming movement. Decorative dial features Roman numerals. Dimensions: 13″ x 9″ x 16″. Made in the USA. 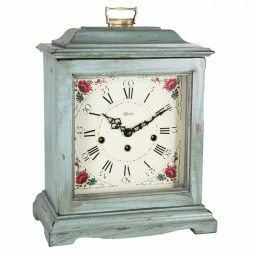 Bracket clock in a distressed light blue finish with a mechanical 8 day Westminster chiming movement. Decorative dial features Roman numerals. Dimensions: 13 x 9 x 16 inches. Made in the USA. 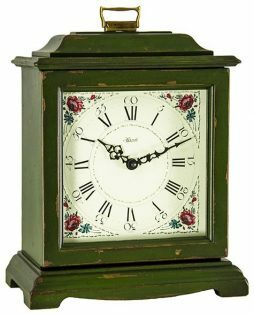 Bracket clock in a distressed dark green finish with a Quartz dual chime movement. Decorative dial features Roman numerals. Dimensions: 13″ x 9″ x 16″. Made in the USA. 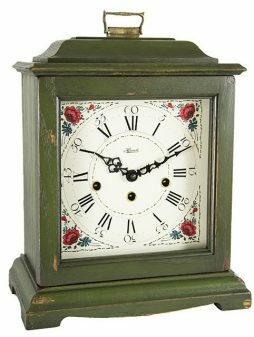 Bracket clock in a distressed dark green finish with a mechanical 8 day Westminster chiming movement. Dimensions: 13 x 9 x 16 inches. A traditional style at an affordable price. This clock has exceptional quality. The crystal glass is held in place with wood strips and brass screws. The door has brass hinges. The dial has an exceptionally beautiful design. The mechanism is made in Germany and features quarter-hour Westminster chimes. This fine clock is assembled in Ohio, USA. Contrasts can be a thing of beauty, especially when perfectly executed in the neutral tones of black and white ensuring they can fit in effortlessly with their surroundings. Like the Oak Ridge Decorative Mantel Clock which will certainly add a touch of captivating beauty to any room you place it in. 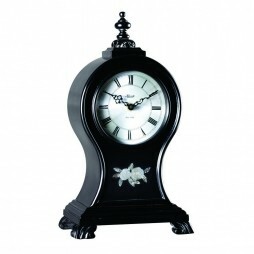 Its white face with Roman numerals and mother of pearl inlay are set in a smooth black case which has clean, classic lines that flare out gently from beneath its decorative finial reminiscent of a chess piece, before narrowing slightly close to the inlay then flaring out again at the base which is supported by four carved feet. 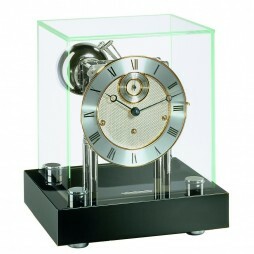 Welcome a touch of subtle glamour to your mantel piece with the Barrister Mechanical Mantel Clock. 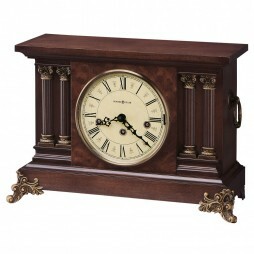 Created with a rich mahogany finish, this unique mantle clock?s distinguishing features include a proportionately large cream colored clock face with large numbers and stylized hands as well as exquisite inlaid marquetry which all stand out against their darker background. Clockshops presents Howard Miller Desiree Mantel Clock with its playful and cheery design to complete the dcor of your room. 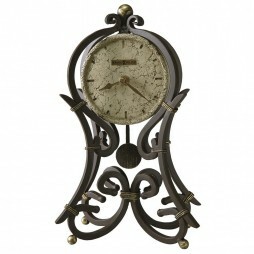 The mantel clock is lightly distressed and features carved leaf and rosette overlays. Beneath a convex glass crystal, the dial offers black Arabic numerals and black serpentine hands. Quartz, dual chime movement plays Westminster or Ave Maria chimes. Features volume control and automatic nighttime chime shut-off option. 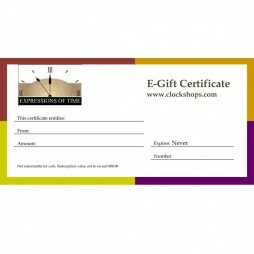 Add some element of fun and liveliness by making this clock adorn your house. This clock is also ideal for all kinds of spaces. 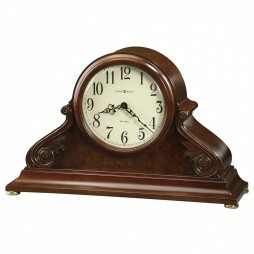 Accentuate the classic look of your room dcor with this Chass Belvedere Mantel Clock from Clockshops. Glass Encased Gear Mechanism and Mahogany Piano Finished Wood make this a real eye-catcher. Powered by quartz technology and long-lasting AA batteries, this elegant wall clock can adorn your home or office. Decorative mantel clocks are a classic representation of the rich history of decoration, which runs way back to the initial caves that humans inhibited. They were decorated with special cave paintings that mainly depicted the type of lives that people lived at the time. And from this humble beginnings, the art of interior decoration has grown into a beauty that is appreciated by everyone. Throughout the ancient times, specifically starting from the Roman era right to the renaissance period, it was mostly the wealthy class and the royalty who engaged in the art of decorating their living spaces. Others worried and focused more on the basics of living and life such as food and shelter. The wealthy certainly had extra money to spend on furnishing their homes with the latest elegant furniture. This was a great way to make a statement to their peers. But as times changed, more people started to view interior decoration as a necessary item in the house. The practice of decoration grew in prominence upon the establishment of the middle class around the western world. This is the era that is known to have created more jobs such as sailors and merchants, jobs which afforded more luxury to a class of people hitherto referred to as the common man. We are now in a modern era where decoration is an important element of any home, and any home owner will go to every extent to ensure that their living spaces are perfectly decorated. This is where decorative mantle clocks find appealing use as the ultimate investment in time. They let you enjoy the brilliance of clever craftsmanship and the gratification of accurate timekeeping. It’s a sure way to add charming appeal to your space. 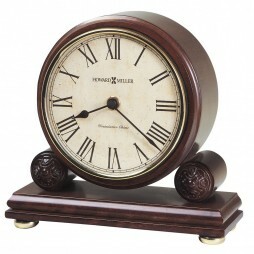 A decorative mantel clock like the Hermle Windfall Barrister Quartz Mantel Clock will spice the decor in your house. 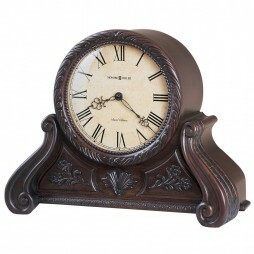 Take time to find the clock that will blend in well with all surrounding decor. Allow it to be the focal point and let everyone enjoy the elegance, style and relaxed feel that only a classic decorative mantle clock can deliver. 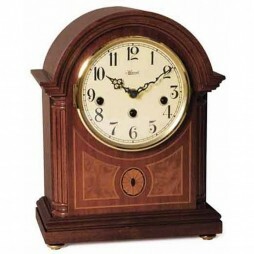 If you have questions or can’t choose between the available clocks for sale, give us a call. Weâ€™ll be happy to help.